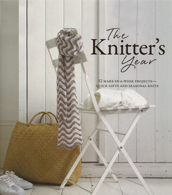 This page lays out everything you need to do about my current year-long project to knit everything in Debbie Bliss’s book A Knitter’s Year–fifty-two projects in fifty-two weeks, one project a week. The weekly project photos are collected here. I can hear you all asking: “Why would someone do this? Don’t you have a job?” Well, the answer to the second question is “yes, I’m an English ‘professor’,” (hence the proper use of punctuation after the previous word), but the answer to the second question is a bit more complicated. I admire Debbie Bliss and her designs immensely, especially her baby designs (I have knitted several), and I think the Cashmerino line is some of the best basic plied yarn that’s available out there. However, it’s not merely this admiration which is driving this project. I’m not 100% in love with every project in this book and, frankly, there are at least a couple I could do without. But more about that as the year unfolds. Like most good knitting goals, I hope this year-long project will both help me learn new techniques I’ve never encountered before and will help me develop better problem-handling skills. 1. I’d like to learn new knitting and finishing techniques. Just a quick glance through the variety of projects in A Knitter’s Year reveals the wide variety of skills required. The patterns call for lots of knitting techniques beyond basic stockinette and garter stitch, including fair isle, cabling, lacework, seaming/grafting, circular/double-pointed knitting, sock-making, making tassels and pom-poms, colorwork, and embroidery. The finishing techniques include sewing knitting to fabric, adding zippers and buttons, beading, stuffing, making pillows and lining purses. While I have used almost all of these techniques before (except I’ve never knitted socks), I’m looking forward to working towards mastery. After all, you know what Malcolm Gladwell says about it taking 10,000 hours. 2. I’d like to improve my time management skills. This was one of my New Year’s Resolutions this year. And, well, last year. And the year before… and… you get the idea. I’ve always had problems with deadlines and I can, if allowed, spend an extraordinary amount of time and effort thinking of how long I can wait to start a project until it officially becomes too late to complete it at the last minute. In my defense, I’m much better than I used to be. Much better. But I still have some lingering issues. “My Year of Knitting Blissfully” is about sticking to goals, meeting deadlines (a week is a week is a week), planning ahead (do I have enough of the right kind of yarn for the project I’m supposed to do three weeks from now? ), and, most important, keeping promises I make to myself. 3. I’d like to get rid of some of my stash. My yarn stash is approaching a level usually associated with some kind of hoarding issue and is slowly threatening to take over my entire office like some kind of wool-based kudzu. Even a recent moth infestation (oh, the humanity!) wasn’t enough to make a real dent in my stash. If you don’t believe me, take a look at my Ravelry stash. Go ahead, I dare you. This abundance is due primarily to several years spent working as a pattern writer (free samples! employee discounts!) and the historical “luck” of living in Los Angeles during the 2000s. Sadly, due to the recession and the ebbing of the recent knitting resurgence, we have seen several knitting stores go out of business in the past 4-5 years (read this entry). This misfortune meant that a lot of high-quality yarn became available at once-in-a-lifetime prices. If at all possible, over the next year, I am going to try to work as many projects as I can with yarn taken from my stash. For the purposes of “My Year of Knitting Blissfully,” the week is considered to begin on Monday at 12:01 am and end on Sunday at 12:00 pm. I have started my year on February 6, 2012 (it’s my birthday) and the year ends on February 3, 2013. My budget cannot exceed $200 total, which includes all yarn, knitting supplies, finishing items (zippers, buttons, fabric, thread), and anything else I haven’t thought of yet. I will keep a weekly tally of the amount of money spent. I will also blog at least twice during the week about each project. The banner picture of this blog be of the previous week’s completed project. Each week is assigned one project that must be completed within the week-long time frame I’ve described under “Rules of the Road.” I have attempted to assign all projects to the particular season they belong to, according to Debbie Bliss’s table of contents in A Knitter’s Year. Winter is considered to go from Dec. 21 – March 20, Spring from March 21 – June 20, Summer from June 21 – September 20, and Fall from September 21 – December 20. Some projects were moved to particular weeks to fit in with my personal and work schedules (more about that in the blog entries). Wish me luck, and happy knitting! Keep checking the blog to follow my progress. Thanks!